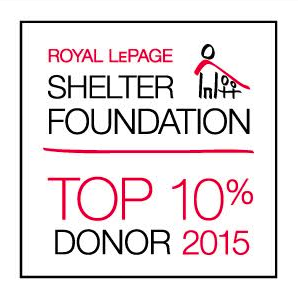 The Royal LePage Shelter Foundation is Canada’s largest public foundation dedicated exclusively to funding women’s shelters and violence prevention and education programs. On any given day in Canada, 6,500 woman and children stay at an emergency shelter to escape domestic violence. Every year, the Foundation provides funds to 200 emergency women's shelter's across Canada and programs hat help woman and children rebuild their lives after violence. Because we believe in the importance of giving back to the community, Royal LePage is the only Canadian real estate company to have our own charitable foundation. All of the administrative costs of the Shelter Foundation are underwritten so that 100% of every dollar donated goes directly to helping our cause. Royal LePage real estate agents and their clients are working to create safer homes and safer communities by contributing more than $22 million since 1998 to help women and children across Canada and a record-breaking $2.3 million during 2015. Through donating a portion of their commission on the purchase or sale of your property, our agents are helping bring hope and provide shelter for those who need it most. Our brokers, agents and staff also provide volunteer time and in-kind goods, and hold special community events to help raise funds and awareness to end family violence for more than 30,000 women and children who take refuge in a shelter each year. For every real estate transaction I complete, I donate a portion of my earnings to the Royal LePage Shelter Foundation. For 2015 I was able to help in more ways because of my clients. Together we can make a difference. Thank you.